With this in mind we will have a celebration. Fat Tuesday is the end of the celebratory season of Carnival. Followed by the observance of the Lenten season. 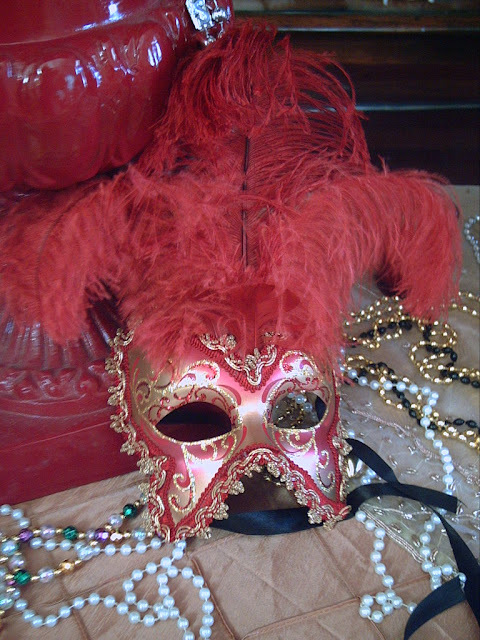 The most used colors of Mardi Gras are Gold for power, Purple for justice , and Green for faith. 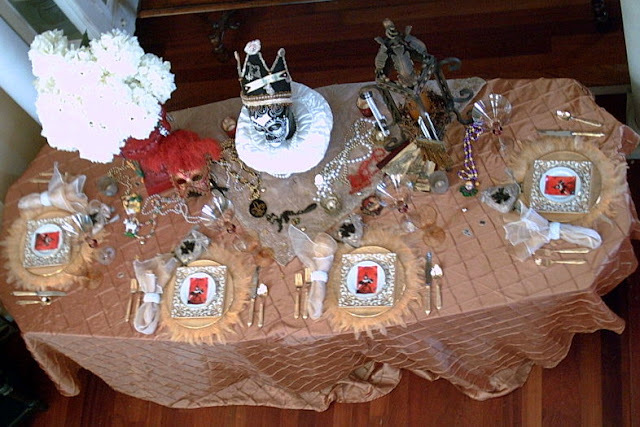 Last year my tablescape was faithful to the main colors of Mardi Gras. See that very fun tablescape here. This year I am using Gold, with some touches of Red. 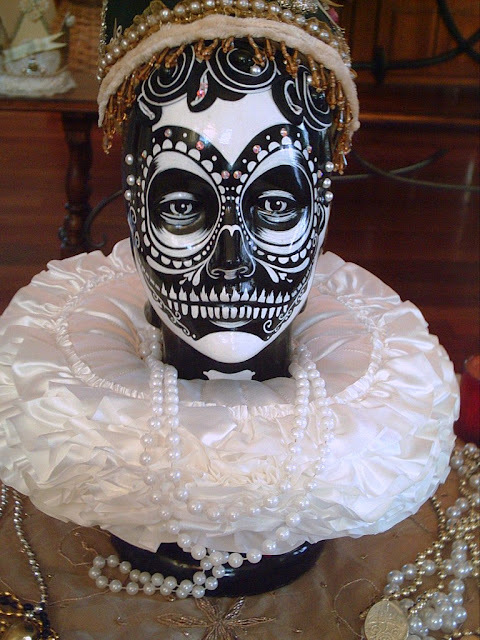 I love to use beautiful lady bust's to showcase the Mardi Gras beads. We actually got the beads from New Orleans. What a wonderful variety of beads they throw out. Some are stunning and beautiful, some are advertising local companies, and some very simple and classic. We love them all and have a large bag full. In New Orleans they have different parades going on. We chose to go to the Family friendly parade. Suitable for all. A very fun and mesmerizing parade. 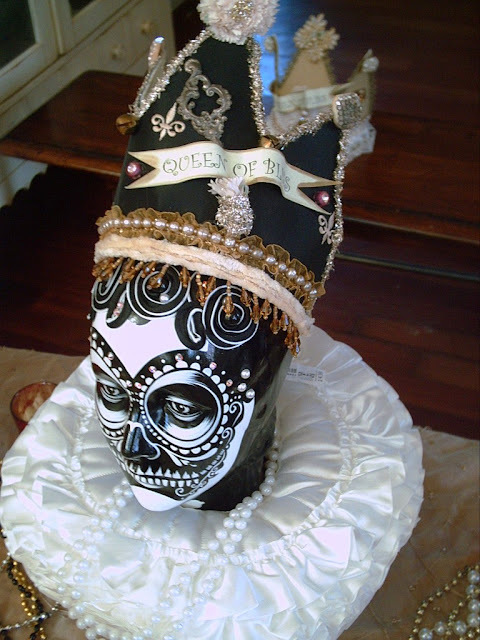 My queen has decoration on her crown, symbolic of the Mardi Gras. She even has a key to the city. 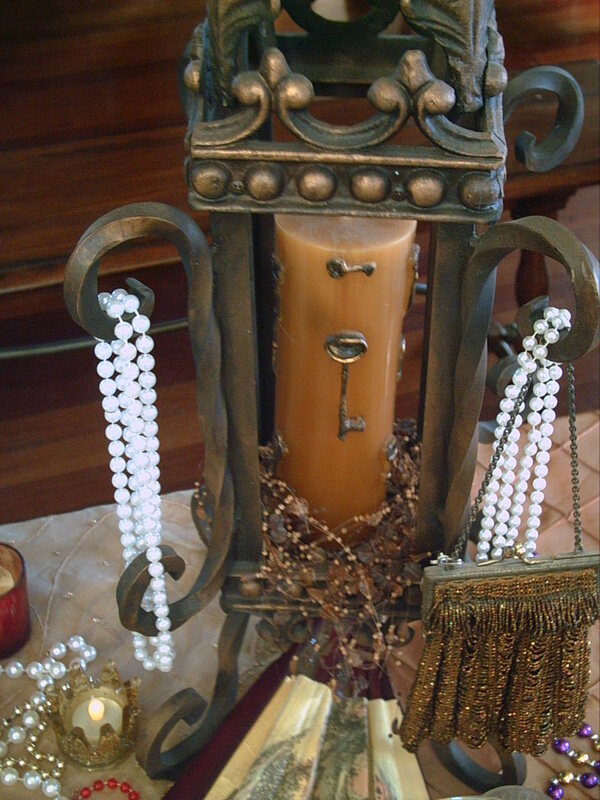 See the candle picture below the Queen, even the candle is embossed with golden keys. 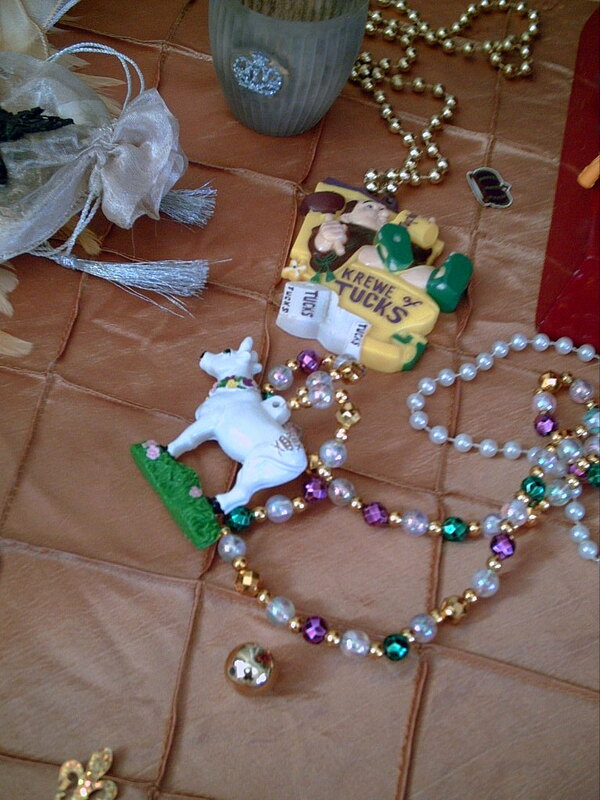 As you can see, scattered across the center of the table are a variety of Mardi Gras beads thrown out from the Parade. I love them. They are so unique. Some are quite fancy. Others are charming and comical advertising necklaces. 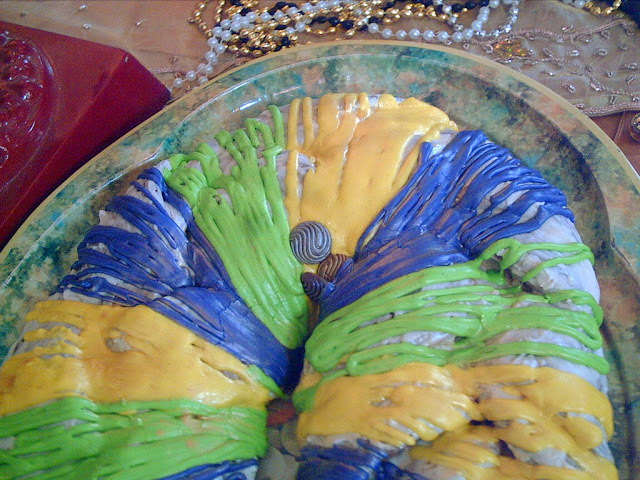 This year for our King Cake, I purchased one from the Amazing bakery Fillings & Emulsions. Their incredible and amazing Pastry Chef competed on the Food Network's 2015, Holiday Baking Championship. He is Adalberto Diaz. I bet you saw him. He is from Cuba and has an amazing life experience. Please check out his website and like them on Facebook. To go into his bakery is a dazzling experience. Prices are great! I don't think I will do as much baking anymore. We are lucky here in Utah to have such a wonderful bakery to go too. Oh and by the way, the taste and flavor is delicious. 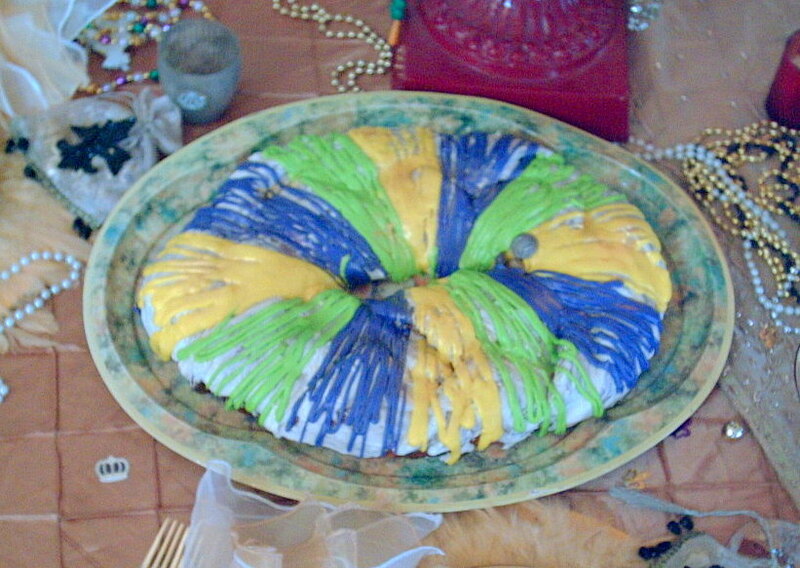 I wish my photo's did justice to the amazing colors of this King Cake. There is enough to serve about 24 people. Who will find the hidden baby inside? Pearl napkin ring, to match the pearls & beads. The "ruff" placed around the Queen's neck is from IKEA. Part of their children's costume line. Such a fun idea for a Medieval costume. My plate stack consists of a golden feather place mat, with a gold dinner plate resting on top. I have a porcelain gold and cream fleur de lis salad plate next. 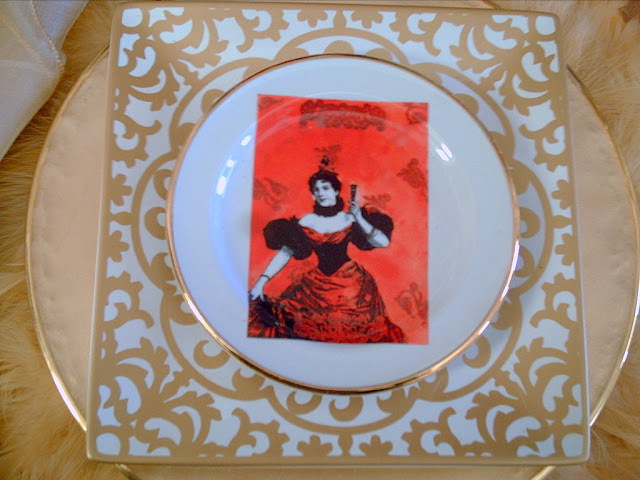 The top plate is a tid bit plate and part of a collection called Moulin Rouge. Thank you for looking. I love comments, they make my day. 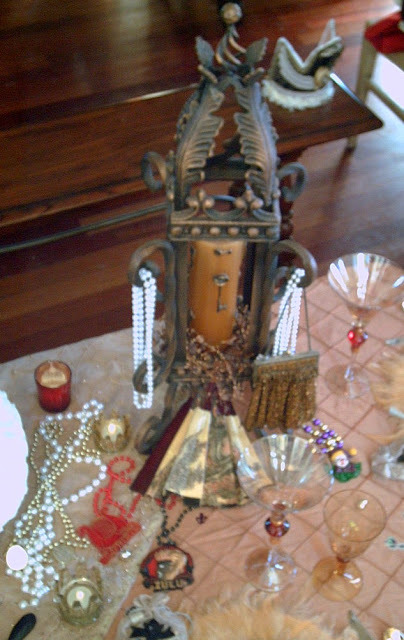 Valerie, this is just the perfect Mardi Gras table. 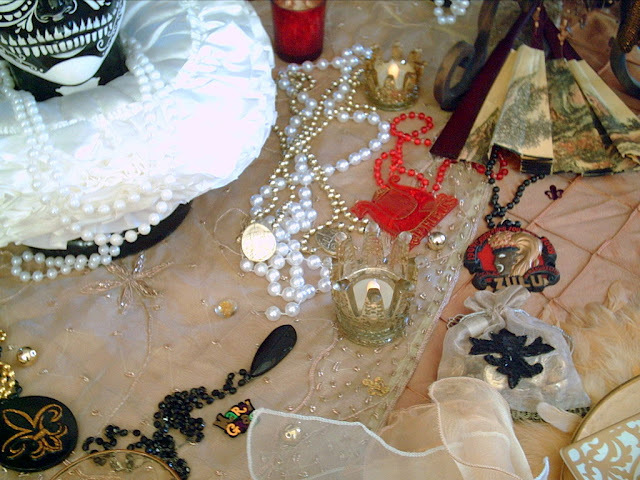 What fun and unique pieces you have, and what a festive mood you created. 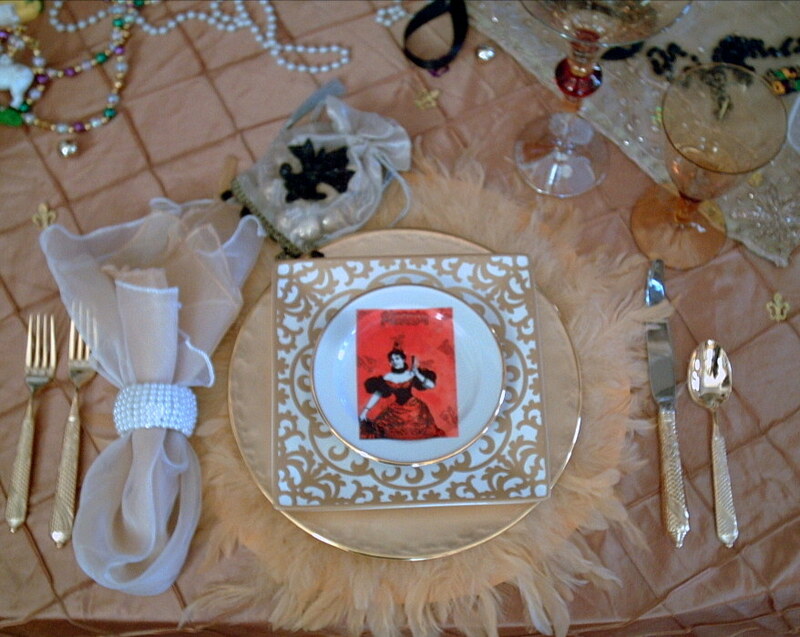 Those feather place mats are fabulous, and all of your touches just add to the celebration atmosphere. How clever to use the collar meant for a children's costume. It's perfect. I so enjoyed seeing this table and all of the elements on it. Valerie, amazing table...and King's Cake! 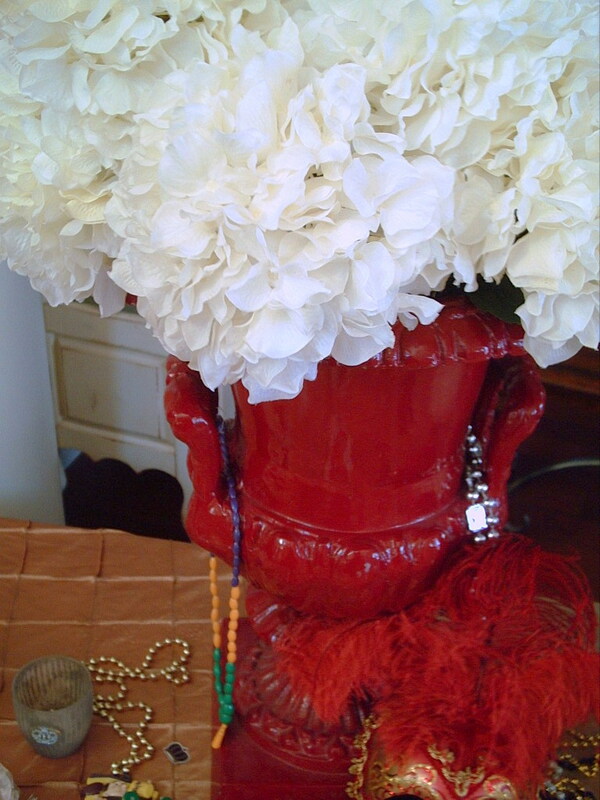 Love the feather placemats. Did you make them, by any chance? I remember seeing some on a blog, maybe Purple Chocolate Home where she made feather placemats...I have been going to try some, but just haven't gotten around to it. 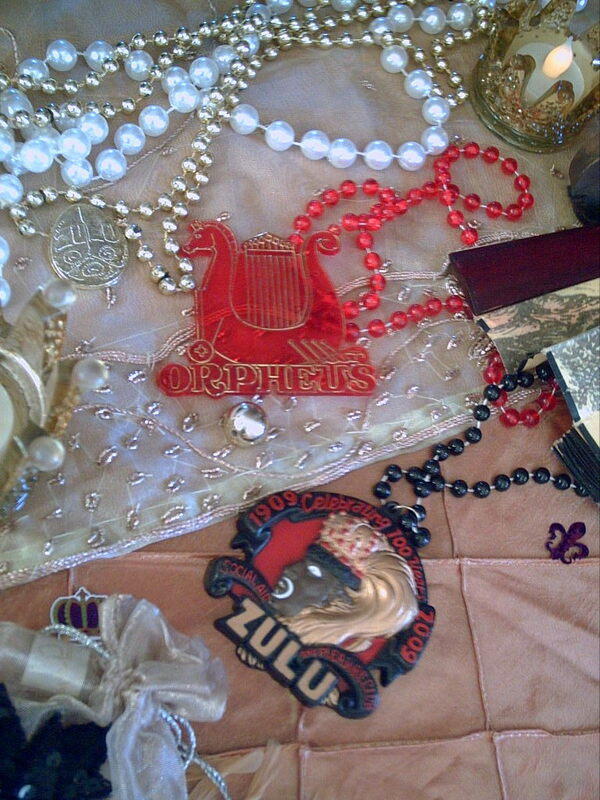 You have so many treasures from Mardi Gras celebrations...love all the different beads. That red mask is awesome! I ♥♥♥ your queen. 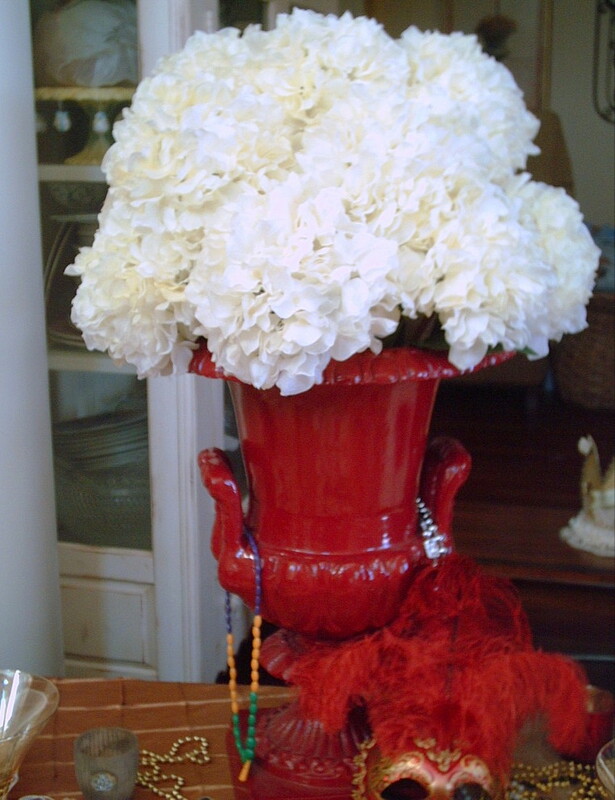 What a gorgeous table Valerie. You have so many wonderful accessories that are fabulous! The queen and the collar is awesome. 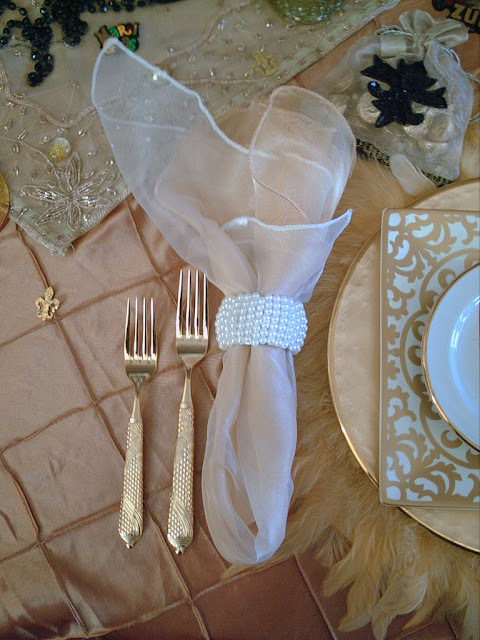 Love the feather placemats, the napking ring and more. Truly, you have gone way of the box with such beautiful elements. The cake is wonderful. Truly a magnificent Mardi Gras Tablescape. What a great Carnival table! I live in New Orleans and rode with the Krewe of Nyx. 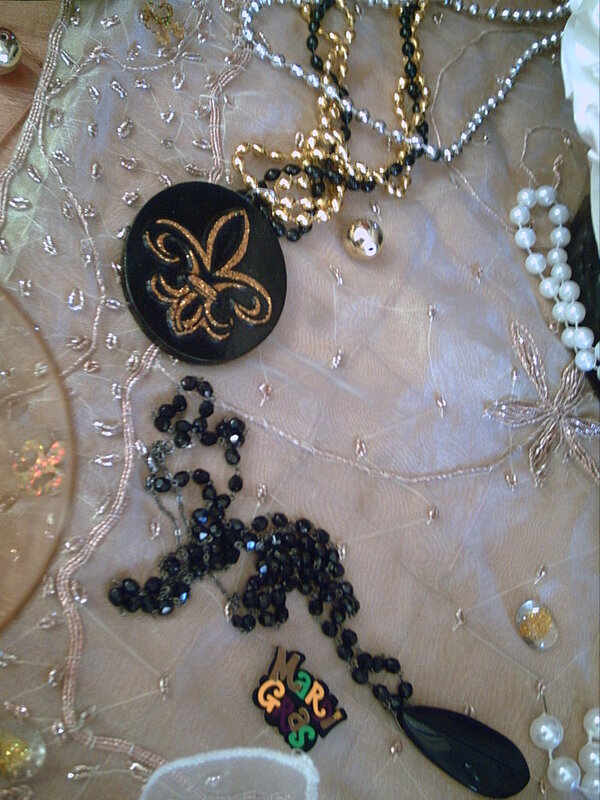 I even threw some of those black and gold fleur de lis beads! My favorite on your table is the Rex Beuf Gras beads. Rex always has such beautiful beads. 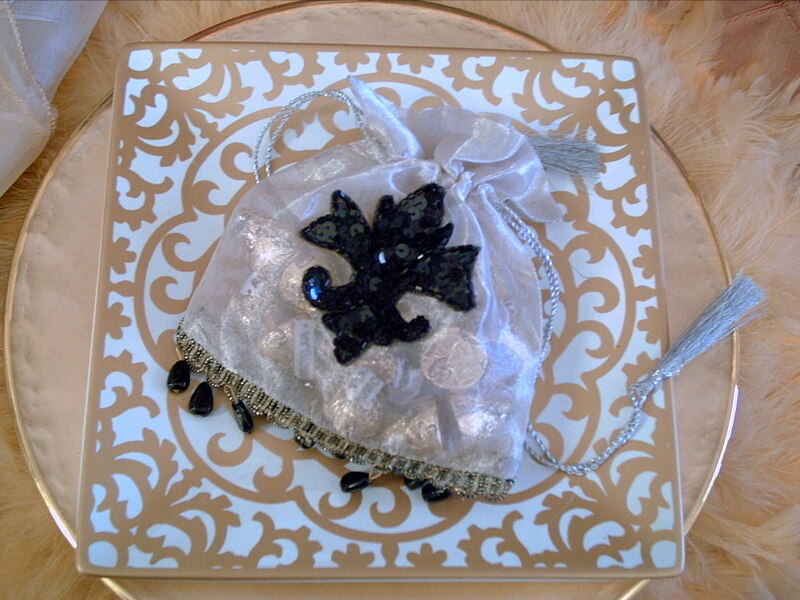 Perfect for setting the Mardi Gras mood! Thank you - hope you have a fabulous Carnival! This is so pretty! Love the queen with the Ruffles white collar. Pretty dishes and love the soft feathery placemats. The cake looks delicious! What a fun table, Valerie. I've never been to Mardi Gras in NOLA. I've seen photos of the craziness in the French Quarter. Don't think that is for me, but would love to see the fun parades. Your collection of beads is great. I've not seen the ones with medallions. Happy Mardi Gras! You pulled out all the stops for this one! How did you get that overhead shot it's a beautiful view. This table is very elegant and inviting. Love it! We are big Mardi Gras fans Valerie, and have been to several parades and also have a bag full of beads...such fun! Your table is festive and fabulous, just like Mardi Gras! This table is just stunning! Mardi Gras is celebrated big time here in St. Louis, believe it or not, but somehow I never got on the bandwagon when it comes to appropriate tablescapes. I think I need to rethink that. 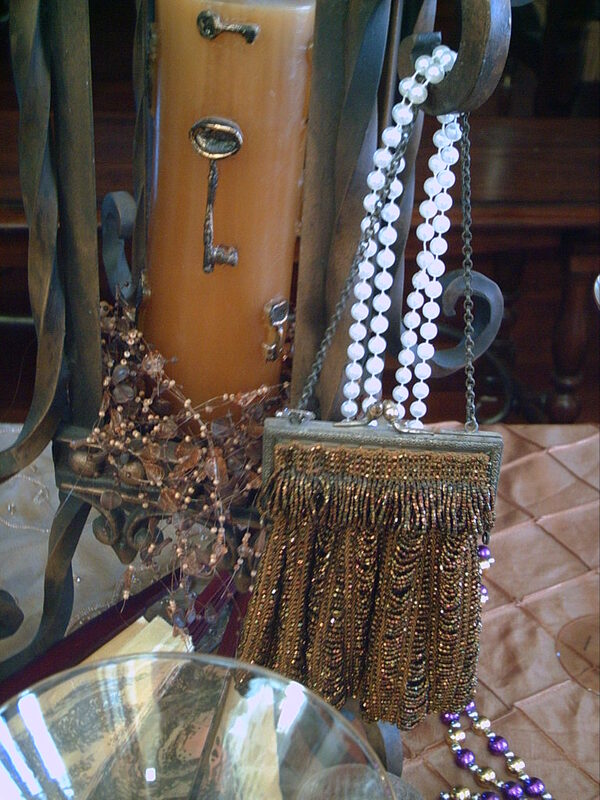 Wow, Valerie, I had to revisit after your purse comment on my Girls and Pearls tablescape. 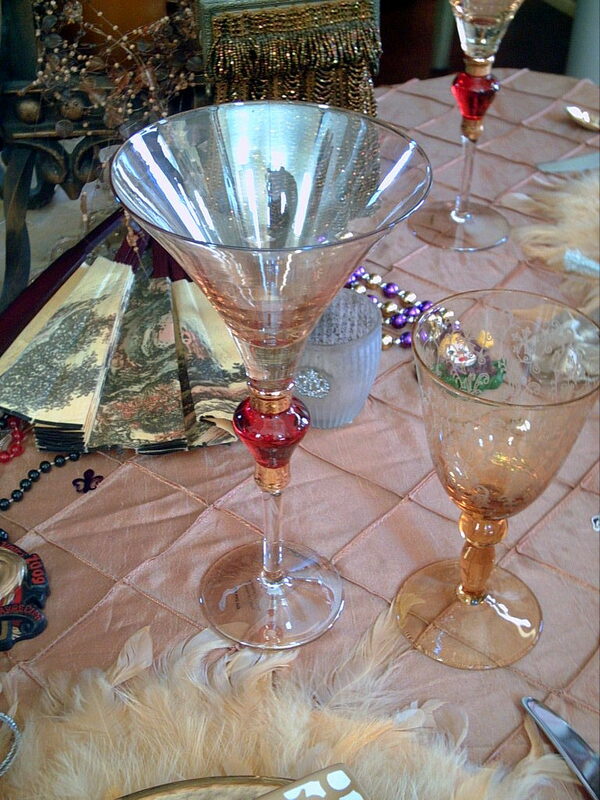 You have such a cool variety of paraphernalia for Mardi Gras, and it's all fabulous! That cake looks so good, and I bet it's all gone (it would be in my house!). Love the gold glass beaded swag (of course I do!). Great job here with all the traditional colors and the added twist of reds.